“I want to be the friend you fall hopelessly in love with. The one you take into your arms and into your bed and into the private world you keep trapped in your head. I want to be that kind of friend. The one who will memorize the things you say as well as the shape of your lips when you say them. I want to know every curve, every freckle, every shiver of your body. "It's raining. The world is weeping at our feet in anticipation of what we're about to do"
Review:Like I said in my Shatter Me Review, how amazing is this cover, I can't express how good they look!! Not only is the cover fabulous, the content inside is just as good. Tahereh Mafi has such a unique writing style and I love the way that she describes things. 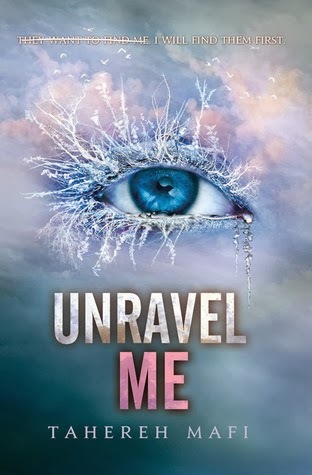 I have to admit that I didn't like Warner so much in Shatter Me but after reading Unravel Me I can't help but like him. You see another side of him that you didn't get to see in Shatter Me. There were many intense moments through out the novel and I felt like I enjoyed this a even more that Shatter Me. I swear at one point in the book my jaw literally dropped. Also Juliette really developed throughout the story, she starts to realise she has to embrace who she is and she really grows. At some points I would get really annoyed with her decisions but I think that was important because it showed her character really change as a person. The ending was pretty intense and do not worry I am not going to give any spoilers. I just really need to get my hands on Ignite Me!! I honestly have no idea what is going to happen next and I cannot wait to find out. Happy Reading Everyone! I hope that you have a fab weekend! THIS BOOK. I'm glad to hear you loved it because I did too. I've lost count of the number of times I've praised Mafi's writing - it's so gorgeous and unique. Juliette's love triangle oscillation in this book annoyed me, but I did appreciate how we got to learn more about Warner. It made him much more likable as a person. I need to go read Ignite Me now! Let's hope it doesn't disappoint either of us. Aspiring to become an author? Jordan has read 0 books toward her goal of 70 books.